Meg Bell, the radiant young woman in the forefront, was Office Manager at Texas Campaign for the Environment ("TCE") when this, our most iconic photo, was taken during the Greenville Avenue St. Patrick's Day Parade recycling effort in 2009. Dozens of folks, including friends, family members, and those crazy kids from TCE (where Eddie had interned as Assistant Campaign Director prior to founding RR) braved the wind and cold that day to volunteer alongside us, inspiring us with camaraderie and support that we've never forgotten. RR was less than a year old then, and the economy was deep in recession; none of us had any idea whether this company would become a real "thing" or just a misguided flash in the pan. We like to think this photo captures the optimism and can-do spirit of our start-up years. Here's to hoping that we never stop believing in ourselves or this community. We've always done it together. We like to think we recognize a revolution when we see one. 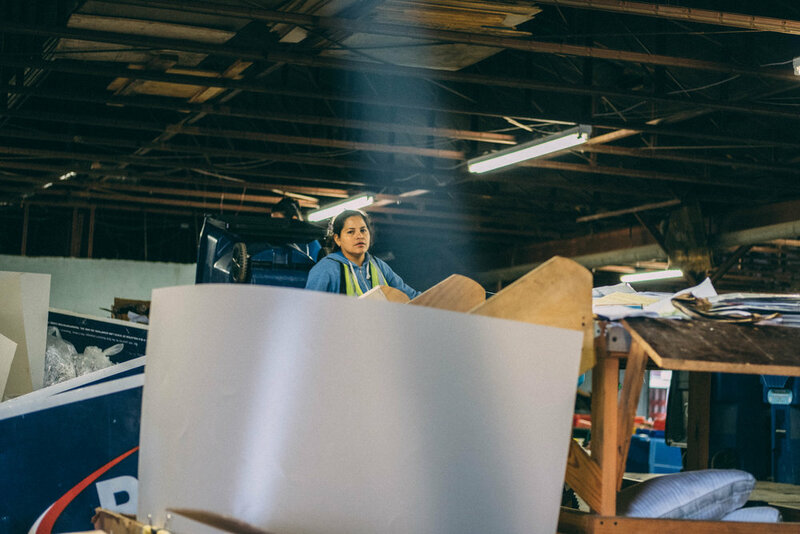 Although others had boldly tried, before Rosa Maldonado walked in our door in 2015, we'd never--in 7 years--had a female employee stand up to the task of full-time in our warehouse. To the uninitiated, the work within our walls is heavy, hard, hot, cold, and often frenetic. Despite constant evolution and mechanization on the collection side of our operation, the operation within our warehouse remains largely manual (for reasons we'll go into later), making it physically demanding. Tiny (5'1") as she is, Rosa is a powerhouse in our operation because of her unwavering optimism, energy, resourcefulness, and drive to achieve. She doesn't just work hard, she works smart, teaching us all a thing or two about our own limitations in the process. 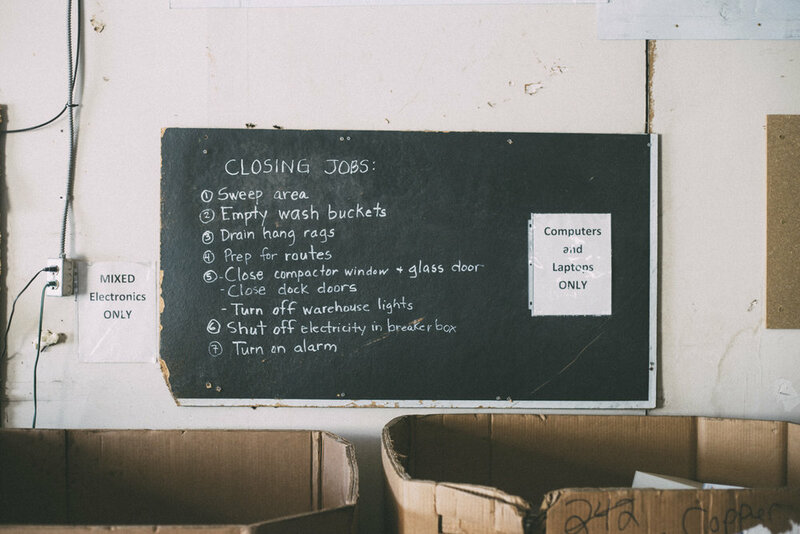 Today, 3 years after Rosa walked in, our warehouse staff is 75% women. That's what you call a revolution, folks. As any North Texan can tell you, the weather around here is a true mixed bag. About 2/3 of all our work is done outside, be it out on the road running routes or back at our Center moving bales around the "yard". Rain, heat, snow, sleet--they all play major factors in our day, but rarely prevent us from getting the job done. It sounds like just another catchy tagline (and we've occasionally capitalized on that! ), but the truth is that when we claim that we've been "recycling since landfilling was cool", it's 100% true. Sadly, if we go by the numbers, landfilling still IS cool in North Texas--much cooler than recycling, composting, or any other resource recovery alternative. The fact that we've been able to make a living by bucking that trend is, above all, a testament to the pioneering businesses we partner with, and to our ability to find them and provide them with the most outstanding service we can. Here's hoping that one day soon recycling is as cool as landfilling. We've always had an all-hands-on-deck approach when it comes to tasks around the Center, but since Maria took the reigns in 2014, it's become official: all of our employees--even Drivers and office workers--are cross-trained to sort, material handle (using forklifts, skid steers, pallet jacks, etc. ), wash bins, assist Community Drop-Off patrons, bale cardboard, and even co-pilot routes. When it comes to driving, though, only our Drivers have that privilege and responsibility. Glass bottles are a big part of our story, and have been a fixture at our Center for as long as we can remember. That's because RR started out with the intention of being the go-to glass bottle recycler for local bars & restaurants. 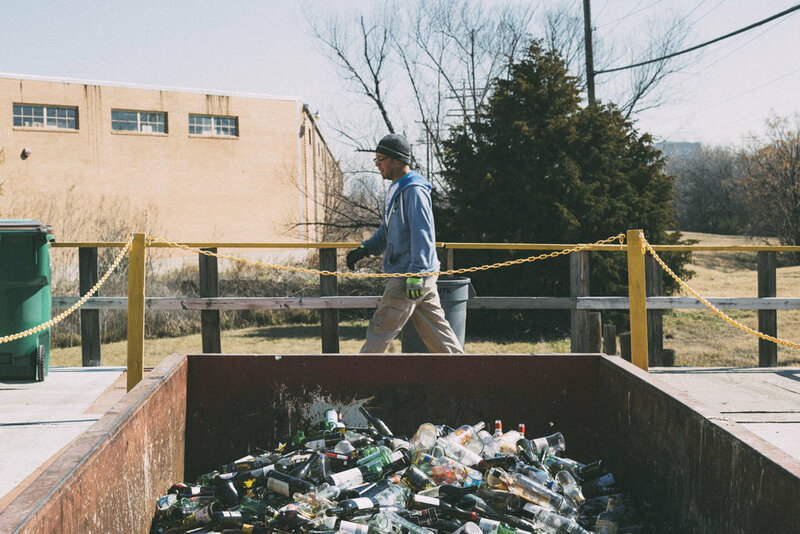 As we've learned over the years, however, bottle recycling isn't something that most bar and restaurant owners value enough to pay for: as of January 1, 2017, just 11 of the estimated 1,168 alcohol-serving establishments in Dallas recycled their glass bottles. The numbers were so shocking and compelling that we started an awareness campaign called #RaiseTheBarDallas the same year. Hopefully it helps. Otherwise, we're confident the City will do something to incentivize the practice eventually. RR is a family-owned company, so please excuse the shameless pics of these (beautiful! smart!) little guys adorning our site. That said, there's much more to these (beautiful! smart!) warehouse-rascals than meets the eye. As many of our peers in the growing North Texas green industry will attest, the best part about our line of work is knowing that our efforts are for the good for others. Having (smart! beautiful!) grandbabies run around the office and yard from time to time is a reminder that the work we do is about so much more than ourselves. We are, above all, a group of people with a purpose. We didn't have the necessary funds to buy a pressure-washer when we first started out in 2008, so we cleaned our bins the old-school way: with our hands, a hose, a towel, and a 5-gallon bucket of soap. We weren't necessarily proud of it (or happy to do it! ), but we did it anyway, because we wanted our bins to be genuinely clean and free of residue and smell each time we delivered. Fast-forward a decade to 2017, and we not only have a pair of high-powered pressure-washers on hand, we're in the process of engineering a much larger, mobile one that will enable us to wash bins (with no run-off) on our Clients' respective sites. Funny thing, though: we still frequently find ourselves handwashing bins at our Center. In the end, it seems the surest way to guarantee the quality we've become accustomed to is to do it with our own two hands. It may not be the most efficient way, but it's not something to be ashamed of, either. Of all our shared values at Recycle Revolution, resourcefulness is the one that has always stood out the most to me (Eddie). If you've never had the unique privilege to work at a small organization dedicated to making big change, it's inspiring to witness what can be done with the right amounts of resourcefulness, optimism, diligence, and dedication. When our staff re-purposed a previously stagnant 18-wheeler bed into a sturdy, multi-tasking outdoor work platform last year, I kept thinking to myself: this type of (outside-the-box) thinking and will to experiment isn't a coincidence... it's what allowed us to get this far in the first place. Hands down, the best thing about working at RR is witnessing the unlikeliest of lives cross paths so meaningfully, if for the shortest of moments. 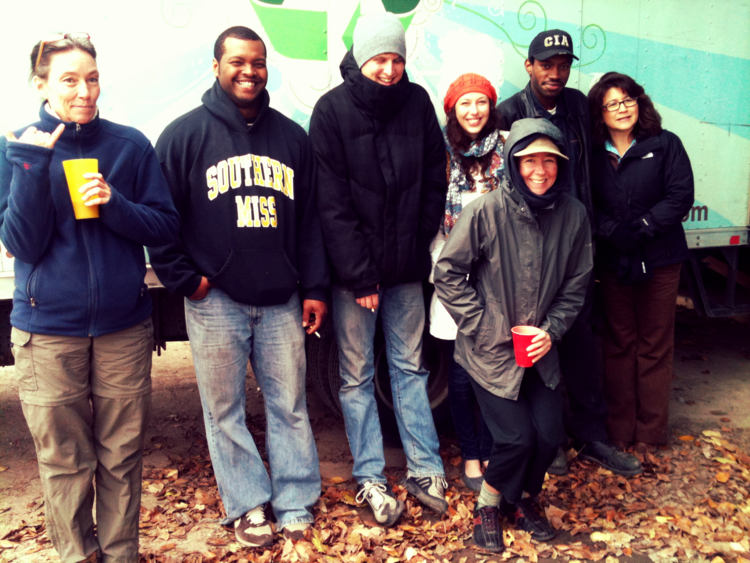 Here, from left to right: Brenda, O.D., Thad, Jordan, Xina, Terrance, and Pat; unforgettable members of a crew of Revolutionaries that stewarded RR in 2011-12. Thank you for your hard work and the wonderful memories! Recycle Revolution is a Woman-Minority-Owned Business enterprise (WMBe), a true rarity in our industry. We're also a family-owned business, which is actually pretty common in the recycling industry. In a lot of ways, RR's operation resembles that of a logistics carrier (like UPS or FedEx): we visit hundreds of establishments around the Dallas-Fort Worth Metroplex each week, often making as many as 800 "pick-ups" during regular business hours. You can understand, then, why we value our Drivers so highly. 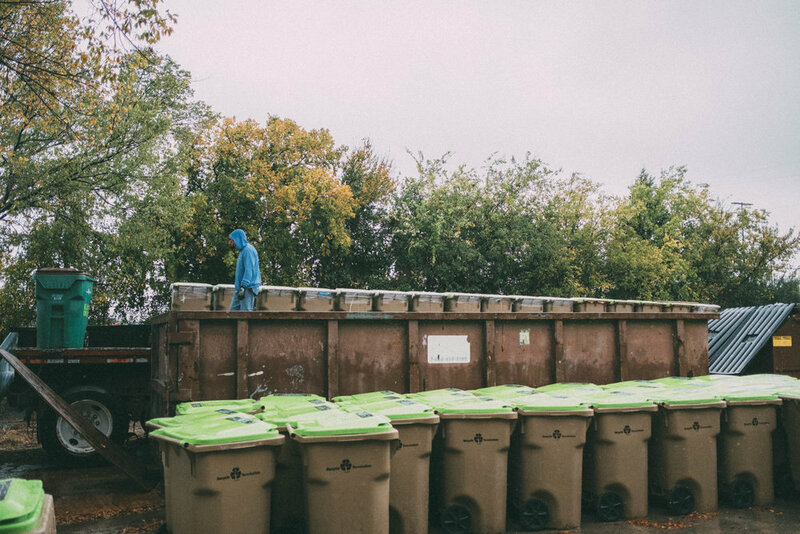 Not only are they expected to be prompt, friendly, fit, and knowledgeable about the local recycling process, they're also expected to safely and courteously navigate large vehicles across North Texas for 8 hours a day. Then there's the little things: double-checking routes, loading and unloading trucks, and (of course) learning about and interfacing with our Clients. In our humble opinion, all professional delivery drivers are under-appreciated. We do our very best to appreciate ours.